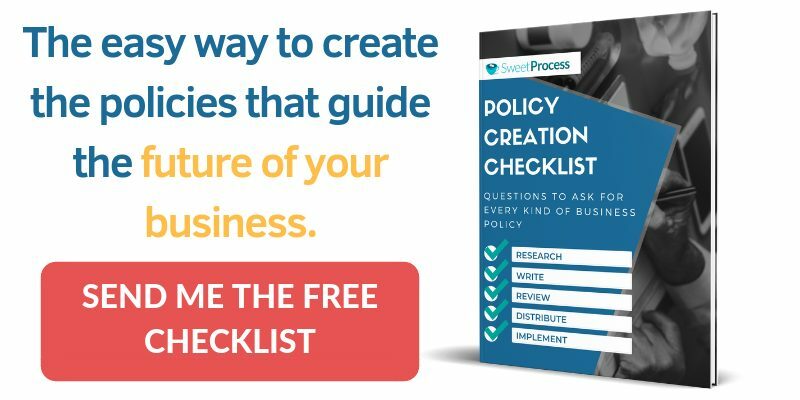 Featured Bonus Content: Download the FREE 6-Step Policy Creation Checklist! You will Discover the Easiest Way to Document Policies and the Right Questions to ask when creating any policy for your organization! Click Here To Download It. It’s seven o’clock in the evening and you’ve just finished dinner. Exhausted from an obnoxiously long day, you sit in front of the TV, ready to catch the game you have been waiting for all week. You figure you can bone up for the meeting about policy management software reading emails on your phone as you drift off to sleep later. Then the phone rings. It’s your CEO. His voice is rushed and he is clearly distressed. He just got word that a new worker in one of the company warehouses ran over another with a forklift. A quick look through his records reveals the company forklift operation procedure never made it to his hand and consequently, he was never properly trained. Sensing the whirlpool of legal trouble about to form, the upper management is panicking. And you, being the company’s chief legal counsel feel yourself being sucked away from your relaxing evening and into the middle of it all. The unfortunate fact is, scenarios such as these are far too common, and companies often find out the hard way that they could have avoided them with a little up-front diligence. That meeting tomorrow about policy management software is something your company has been avoiding. However, some automation in the picture may have kept this slip-up from happening. Modern, cloud-based policy management solutions can make the right information available at the right time, helping employees understand what needs to be done, without overwhelming them. Furthermore, they can help you capture information, update policies quickly, and keep all the info in a central database which can be made available on demand through any device. In this resource, we will detail everything you need to know about modern policy management software, what the best options are, and what unique features they bring to the table. 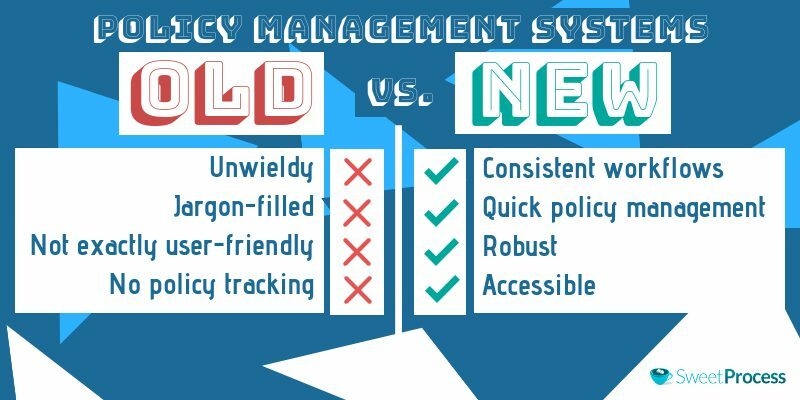 Why you need a Policy Management Software? Five Policy Management Software Tools For Your Consideration. Crafting the Perfect Policy for Your Company. Do’s and Don’ts of Creating a Company Policy. Implementing Your Policies Once They Are Created. Getting Employees to Follow Company Policies. Good question. After all, what’s wrong with the old ways to create and manage policies? Why not just stick with ye olde policy binders or distribute digital copies of your company policies. Heck, who even follows a policy right down to the T anyway? They can be extremely unwieldy: When in the thick of things, people want precise information ASAP. Having to sift through a ton of data can lead to confusion. Not to mention, they may inadvertently use the wrong policy or procedure when under stress. Filled with jargon: Policies are almost always more concerned with accurate legal representation than employee engagement. A bored employee may not pay enough attention to policy specifics. May actually drive employees away: Another consequence of lack of engagement is that employees may resort to asking others and guessing—an extremely risky scenario, to say the least. No ability to track policy implementation: Since policies deal with human behavior, management has to rely on supervisor feedback to know if a policy is being followed. All of these are serious issues most companies have simply learned to live or cope with when there were no viable solutions. However, modern policy management solutions make such issues a thing of the past. Policy and process management in the 21st century is becoming an increasingly complex affair as business processes and the legal mandates companies must conform to are in a constant state of flux. While manual policy management solutions are effective to some extent, more sophisticated tools exist. Evolving software automates many of the required processes, helping avert disasters like the untrained forklift operator running over fellow employees. Modern policy management solutions are designed to specifically help your company steer clear of trouble and ensure everyone knows what they are supposed to do. They help you craft policies that are compliant, thorough, and engaging. Many policy management software suites allow you to add interactive content to help employees make more sense of what is required of them. Consistent workflows: Suites offer templates and best practices that can help you design accurate policies. Policies can be reviewed, edited, and approved more easily thanks to powerful search features as well. Reduces time to manage policies: By centralizing all policies in a database, employees save precious time by quickly accessing information when needed. Robust version control: A staple in every policy management software suite, version control can help you avoid duplicate and/or outdated policies. Easy audit trails: Organizations in highly regulated industries such as healthcare and finance require a steady stream of audit trails to keep up with changing legal landscapes. Easy accessibility: Since policy management suites are cloud-based tools, they can be accessed mobily. Quiz your employees: It’s one thing to have an employee’s signature, it’s another to know if they actually understand the policy. Most suites discussed here allow you to quiz your employees, engaging them and testing their knowledge. Affordable: Like most cloud-based services, policy management software suites are typically easy on the wallet and come with excellent support. Given the highly fluid markets that most companies exist in today, policy management software solutions have become indispensable tools that keep a company running smoothly and out of legal trouble. In the following chapter, we discuss five feature-packed policy management suites that can help you avert even the most unlikely disasters. Much like every cloud-based service today, Policy Management Software come in all shapes, sizes, and flavors. Some tools are just better designed and easier to use than others. In this section, we discuss five that get just about everything right. Designed For: Education, Healthcare, Manufacturing, Retail, Transportation, Insurance, Finance, Energy. ConvergePoint Policy Management suite is integrated with Office 365 and Sharepoint allowing you to seamlessly create, review, and approve policies within your chosen productivity tool. 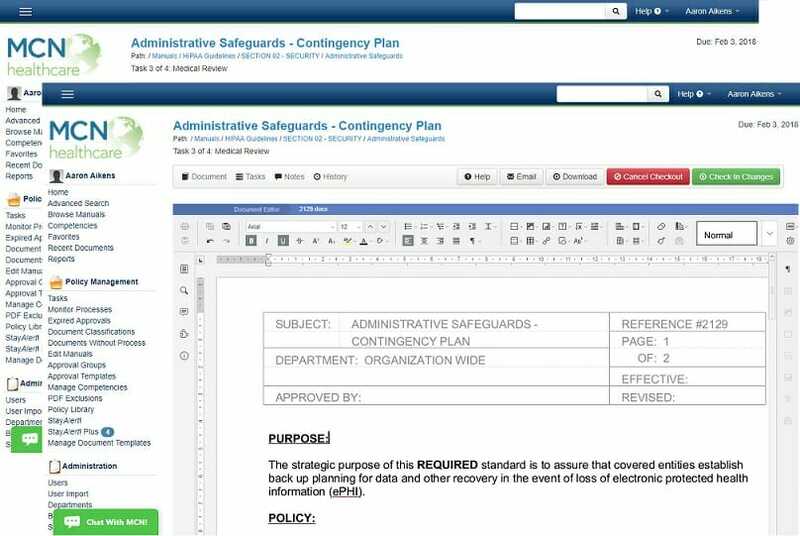 All policies can be created using ConvergePoint’s rule-based workflows that issue alerts and connect the right person with the required information at the right time. Policies can be made using documents uploaded to the suite or by using one of the many templates provided. The software keeps a full audit trail for later reference while real-time dashboards provide insights into the status of each policy. 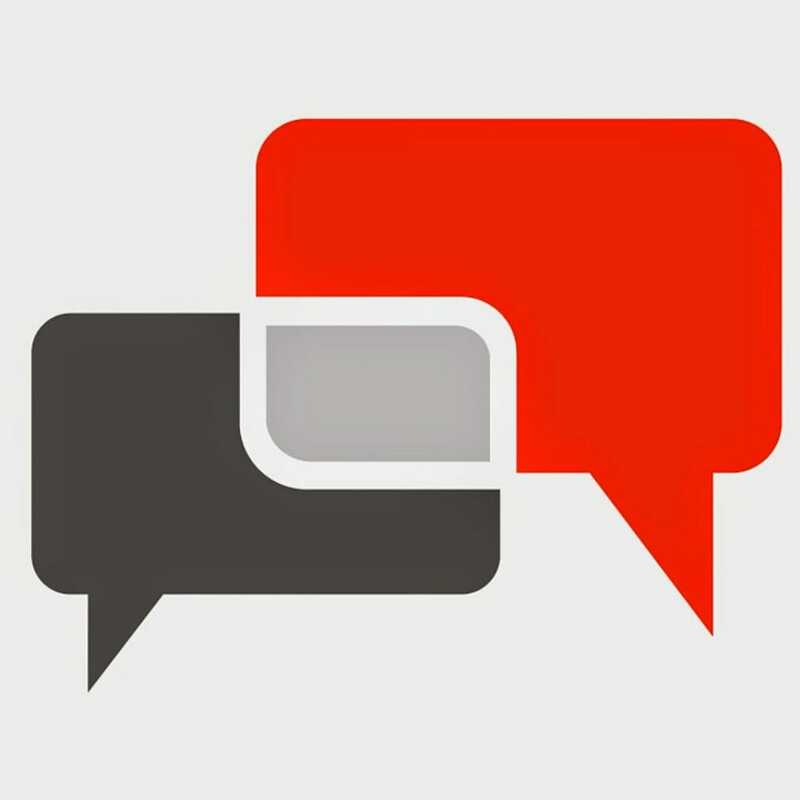 Taking a leaf out of social productivity tools like Slack, Convergepoint centralizes all communication into a discussion board where comments can be added to each policy. Role-based user access controls who sees what according to what pertains to their job. Convergepoint clearly understands that the real problem with policies often isn’t documenting them but finding relevant information when needed. Consequently, their search and reporting features are second to none. Policies can be published to a centralized location where employees can access them. Employees can use metadata, tags, and keywords to quickly find the right policies and/or information within them. Finally, you can also train and test your employees within the suite by sending them quizzes after a new policy is created. All progress can be tracked from the dashboard. Onspring has been at the forefront of risk, compliance, and business process automation technology since 2010. Their policy management software is one of many business solutions they offer which suits almost every business niche and comes chock full of useful features. What sets Onspring’s solution apart is its remarkable flexibility. Users can take the out-of-the-box solution and customize it to fit whatever policy management requirements they might have. Like all major policy management software solutions, Onspring allows you to upload your own policies, or use their templates to create new ones. The policy documents can then be distributed in MS Word or PDF formats. Users can also suggest new policies or propose changes to existing documents from within Onspring. Their requests can be directly routed through the policy workflow via key attributes such as category or owner. Similar to ConvergePoint, Onspring can capture and work on policy-related issues and exceptions within a workflow. Users can discuss how to solve any problems they may be facing and update documents as needed. Onspring’s policy attestation surveys are designed to help your employees understand each policy. The reports can be accessed through a dashboard. Finally, content can also be distributed via automated emails which remind employees to complete tasks and help them keep policies fresh in their minds. While many companies will resort to pumping their product full of features to attract more business, Mitratech has decided to stick to the basics and do them better than everyone else. Creating policies within PolicyHub is so straightforward that you won’t need any special classes or training to start using it. Even admins only need a day’s worth of training to understand the nuances of the software. PolicyHub comes with an intelligent distribution system that sends out updates to every person affected by policy changes. Furthermore, attestation and compliance tasks are easy to carry out and record. Built-in tools allow you to analyze whether new policies are having the desired effect or not. Unlike some vendors, Mitratech uses their own tools for their business operations as well as offering them to other companies. The result is an exceedingly well-thought-out, constantly evolving solution that is designed from the ground up by users for users. PolicyHub can be implemented as a cloud-based SaaS for simplicity or using on-premise deployment should the organization require more control. The importance of having robust policies in healthcare cannot be overstated. As healthcare organizations often have thousands upon thousands of policies to refer to, simple manuals may not suffice. MCN is a premier provider of documentation and content management solutions for the healthcare industry and their policy tool is second to none. MCN’s policy management software solution offers several features that healthcare institutions will find useful. For starters, the toolkit comes with over 20,000 up-to-date customizable policy documents that can be used as templates to create your own. The policy creation and implementation workflows are not only intelligently designed, but fairly flexible as well. Approval processes can be directed to certain groups within an organization or forwarded to outside groups if needed. MCN’s StayAlert! The feature is particularly useful as it constantly keeps you updated on the latest regulatory changes that affect your healthcare policies. These changes can then be quickly added to a policy (if needed) within the suite. StayAlert! scans all major outlets such as HHS, CMS, CDC, FDA, OCR, HIPAA, OSHA and others. Finally, MCN’s awesome customer care deserves a special mention. Their speed is particularly helpful as queries in healthcare require quick, accurate responses. Coupled with weekly webinars and StayAlert!, MCN can help you stay on top of all the latest goings-on in the healthcare world. Training: Documentation, videos, blog, online demos. Collaborate with your employees to document your policies. Tracking the approval of changes to policies. Easily document policies, procedures, and even process. Ability to assign tasks to your employees and track their progress. Real-time audit trail for every document. While policies form the theoretical basis for how an organization ought to work, procedures are their practical versions, giving concise step-by-step instructions on how a policy ought to be implemented. SweetProcess comes divided into three categories – policies, processes and procedures, offering a set of tools to create and seamlessly implement all your internal documentation.You can create and store an unlimited number of both policies and procedures, and existing policies can be imported into the system as well. What sets SweetProcess apart from other policy management suites is that the software places special emphasis on capturing real-time information on how a company works rather than trying to force a theoretical model onto it. This document-as-you-go design philosophy allows for a truly realistic development of policies that perfectly reflect a company’s working style. There’s a lot for you to consider when creating a policy. Since a company policy is never a done and dusted affair, you need to have a process in place not only for creating one but for constantly refining it as well. Even though the policy management software mentioned above come with their own set of workflows, there is a lot of legwork that remains before and after you are done with them. Agenda setting: Identify the issue and define all parameters. At this stage, define the problem and understand its various components. Policy formulation: Set objectives, identify costs, and understand the effects of the solution. Choose the best tools (or “policy instruments”) to tackle targeted issues. Legitimation: Get support from all stakeholders. Everyone from management to the teams that will execute the policy need to be made aware of the issues, and which policy instrument will be used to tackle it. Feedback can be used to refine the policy further at this stage. Implementation: Distribute the policy text to all concerned departments. You should ensure your organization has the resources (staff, money and legal authority) to implement the policy and make teams and employees accountable for carrying out the instructions laid out in the policy at this stage. Evaluation: Understand to what extent the policy was successful. Did it have the desired effect? If not, then why? What undesirable effects did you face? Can you improve the policy? Policy maintenance, succession or termination: Once you have some experience with the policy, you can decide to keep it as it is, update it with the aid of insights gained, or replace it with another policy. Be reasonable: As policies rely on rules, you should clearly spell out the consequences of not adhering to them. Also, match punishments to infractions, as becoming overly strict can affect company culture adversely, while being too lenient can mean problems remain unresolved. Be relevant: Ask yourself whether your policy instructions address the issue at hand properly. Trying to tackle too many problems with one policy document can lead to confusion. Each policy document should address one issue thoroughly. Do you have the needed support? Do you have enough time to implement the policy? What mechanisms do you have to see whether the policy is being followed? Are the issues related to the policy well understood? Are the rewards and penalties related to the policy established and understood? 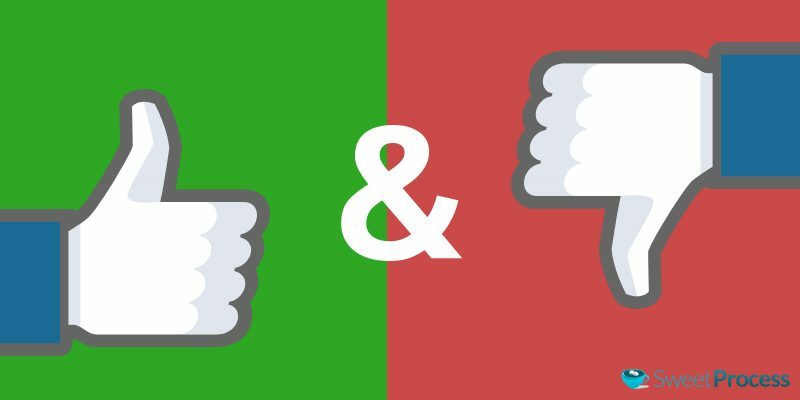 Do you have a secure feedback mechanism? Dos and Don’ts of Creating a Company Policy. Include your company values, goals and mission statement when creating a policy. Doing so can help you strengthen your company culture. Follow a single structure when creating a policy. The more you experiment, the greater the chances something will go wrong. Clearly define which people are responsible for carrying out a policy. The roles are best defined early on. All required processes and procedures should be provided in an easy-to-access way. Consider the opinions and feedback of the people who will be carrying out the policy before creating it. Consider using the tools that are currently available. While policies are important, they need to be working for you, not the other way round. Encourage people to share violations, concerns, or reservations after the policy has been implemented. It can help you create better versions down the line. Have a proper structure for reviewing policies. Have a well-defined medium for distributing policies. Get a “read-and-understood” receipt every time you deliver a policy to an employee. Get confused between policies, procedures and processes. They are not the same. Load your policies with jargon, unnecessarily tough vocabulary or overly long sentences. The simpler the policies are, the better the chances they will be followed. Create or edit policies every time something happens. Think things through and make changes to them if there is absolutely no choice. Overlook the importance of having a standardized process for self-development and maintaining policies. Use multiple documenting methods while capturing information and creating policies. Forget to get read receipts for new policies. This cannot be emphasized enough. Forget to track regulatory changes. Create a system to ensure you know of new regulations when they are published. Get bogged down with visual representations at the expense of the actual processes and steps involved in the policy. Overemphasize the role of tools. While technology can be an enabling factor, it can become a crutch. Have some contingency measures in place that detail steps to take if those tools suddenly become unavailable. Stop updating your policies. They are never complete and need to reflect the state your company is in along with how it ought to be. But don’t change them just for the sake of it. No amount of forethought, debate, and intelligence can make up for faulty execution. While putting in a lot of work when creating policies is great, you should also understand the larger context they will be operating in to successfully implement them. Policy: An overarching guideline that gives an organization direction. It describes the why behind an action, accountabilities, and potential penalties. Process: A map of how to navigate towards said direction. Essentially, a process attempts to answer the what, when, who, and where of a policy. Procedure: Step-by-step instructions on how to carry out the process. The how behind the process’s what. Creating a Business Process to Implement Your Policies. A policy is only as good as its execution. Creating a system to ensure your policies are distributed, understood, and acted upon is just as vital as the policy itself. It’s easy to find overly complex processes that are essentially a collection of different procedures quickly becoming defunct as no one uses them. The most effective processes are simple, easy to understand, and to the point. Reactive: Your process is either underperforming or has failed. You can carry out process mapping to identify the issue and fix it. Strategic: You feel the organization needs to head in a new direction. Process mapping can be useful to help you understand your new goals. Customer-focused: Your processes that connect the organization to the customers need to be either amended or overhauled. You can use process mapping to define areas for improvement. Put the right team together: As company-wide changes can be threatening to employees, it’s best to involve them from the get-go. Look for evangelists who are willing to support your initiative and spread the word. These people will also make ideal team leaders. Interview key figures: Even though you may be confident that your processes are perfect, it is vital that you gain insights from people who will be involved in seeing the process through. Interviewing them will help you understand their views, biases, and objections better and be reflected in the process if needed. Create a baseline business process map: You have all the data you need and are confident a solution can be charted out. Put your ideas on paper (or a computer screen) to show how you think the process will work out. Use one of the tools given above in order to do so. Identify areas for improvement: Remember, your first map is baseline only. As you implement it, many unknowns will make themselves known which can then be factored into the plan. 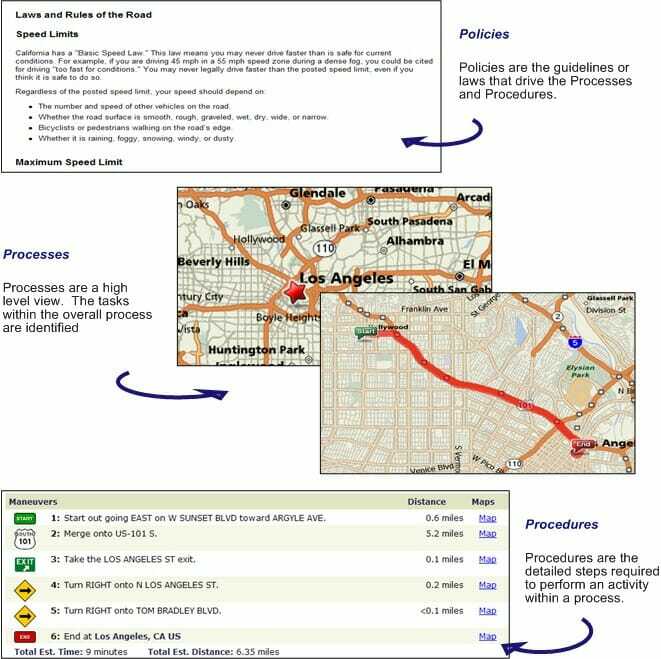 If your map is proving to be inadequate, then you might even have to start the process over. Monitor improvements: Is the process actually resulting in the desired outcome? Creating a system to monitor the process is just as important as the process itself. Always observe and document each step of the process to see how it is panning out. The resulting insights will help you make the next decision an even better one. Process Flowcharts: The simplest way to visualize a process. Flowcharts lay out all the steps in an easy-to-grasp manner using simple geometric shapes and pathways that show the course of action needed. Swimlane Diagram: Takes the flowchart concept a step further by dividing the steps between different teams or individuals so that everyone knows when their tasks start and end. Value Stream Map: Identifies areas in a process that add the most value and focus on removing waste. Unlike flowcharts and swimlane diagrams, value stream maps are usually drawn using standard symbols or icons. Valuable for more complex processes, value streams are best used to gain an in-depth look into them. Creating Standard Operating Procedures Your Employees Will Actually Follow. By now, you have a general idea of where to head, why it’s important, and what needs to be done. Your dream won’t be realized until you show everyone how. Procedures will help you do just that. Break-down every step in a process: You identified the steps that needed to be taken when writing down your process. But, just how will those steps need to be carried out? Think of the simplest way you can explain them. Try every step of the process out yourself, then ask a staff member to do so. Understand the scope of a procedure: Processes may overlap different business functions. However, procedures need to be confined to one process only. Use a consistent style throughout your procedures: Jumping between different fonts, formats, tones, and voices can lead to confusion and throw your projects into disarray. Chose a style and stick with it. Not only will it help people understand your thoughts better, but it can help you reinforce your company culture as well. Create a checklist: At the heart of a SOP lies a checklist that details every step involved in a procedure. Multiple checklists can be used if the number of steps is too long. Check out our article on checklist apps for the lowdown on checklists and the best tools to create them. Determine which metrics to measure against a SOP: Each SOP should come with a set of metrics that helps you understand how well you’re performing. Brainstorm with your team members and come up with a list of the most relevant metrics for each. Policy creation is as much an exercise in planning as it is in managing expectations. The more a company grows, the more complex its policies become. Consequently, the harder it is to explain their relevance and get people to follow them. You would have noticed that many of the steps described above involve getting opinions, conducting interviews, and gaining feedback. Not only will doing so help you iron out deficiencies in your plan early on, but it will also help employees gain a deeper understanding of why the policies need to be followed. The tools described above will go a long way in helping you ensure your employees follow the procedures. Here are a few ways to use them efficiently. Scattered policy documents: Policies are not located in a centralized database for quick reference. Employees need to refer to various people before they can access the policies they need. Hard-to-find information within documents: Poor organization, no index, and jargon-heavy language in policies can all cause confusion and delay. Employees have to scan various files, binders, and PDFs to try and pinpoint the exact piece of information they are looking for. Consider using a template and one style of organization for all your policies to ensure your employees can find the information they are looking for. To ensure such scenarios never present themselves, centralize all your policies into one easy-to-access database. Follow one style for crafting all policies; it will help employees quickly locate information they are looking for. 2. Make sure your policies are up-to-date: Outdated, irrelevant policies can quickly become a thorn if employees are forced to follow them. Not adapting policies to changing circumstances can drop productivity and lead to confusion, resentment, and even invite legal action! More often than not, unused policies, processes, and procedures are the ones that have not been updated. 3. Simplify, but don’t overdo it: Simplicity is always preferred, but leaving too much to the imagination can backfire, too. Ask two groups of employees to critique a policy document to find loopholes and oversights. One group should consist of employees who do the task the policy governs, while the other can consist of people who do not. This way you can catch oversights from group one, while group two can bring in an outsider’s perspective to the exercise. 4. Give people space: Becoming overly restrictive for want of getting it right the first time often backfires as such policies engender resentment in employees. Policies are best left to the domain of what’s essential. Finding that perfect balance between authority and personal freedom helps your employees perform their best. 5. Always get an acknowledgement: Besides the legal reasons for getting an acknowledgement from employees regarding policies, it can help instill a level of accountability as well. 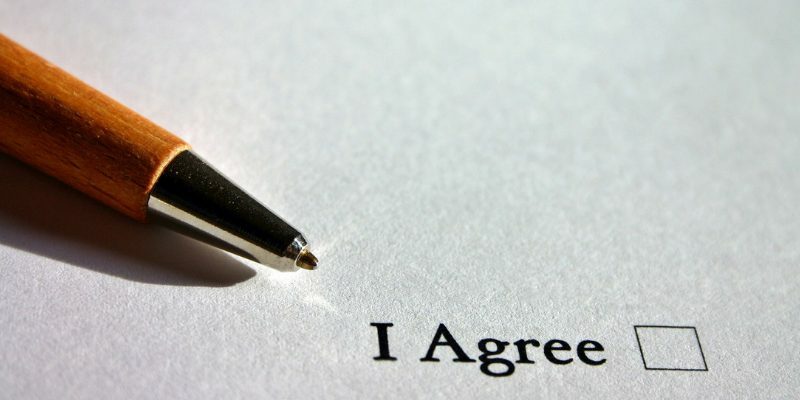 Employees who have signed a policy document know they have no one but themselves to blame should they fail to adhere to it. 6. Find ways to get employees to understand policies: Policy management software can be a great tool here. You can quiz your employees to gauge their level of understanding. Monthly or bi-monthly meetings can be a great aid as well. 7. Include as much content from employees into policies as possible: Taking the idea of accountability a step further, you can have the employees draft parts of a policy they have more insight into. 8. Reward those who follow, guide those who don’t: Setting examples and helping those who have trouble following a policy can help build trust in leadership. While resorting to punitive measures will seem like the obvious move when someone falls out of line, patience is recommended. Using defaulters as a case-study to understand why deviance at the workplace occurs can help you pinpoint the problem, and make sure it never happens again. What’s more, it can help you correct your policies. Policies, like the company work culture they are a part of, are a never-ending endeavor. Since a company exists to respond to changing market dynamics (if not to cause them), their policies need to be ready to adapt to new situations as they present themselves. Brands that operate in highly regulated industries like healthcare, finance, and IT need to go the extra mile to ensure their policies are understood and followed every time, on time. 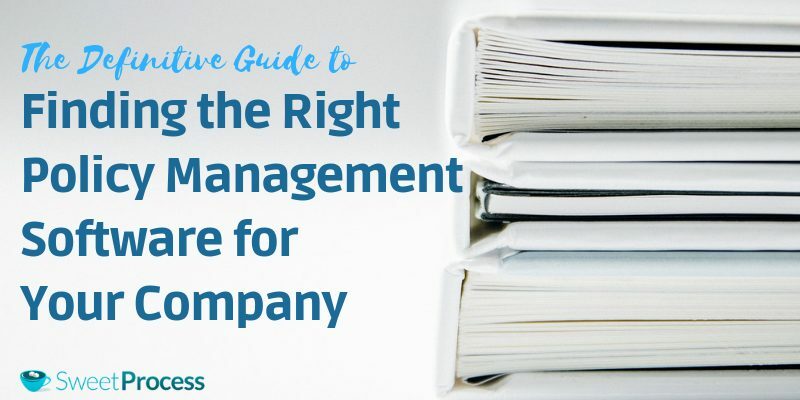 In such a fluid and fast-paced environment, manual entry and management of important documents can become extremely tedious and relegate the company to the dark ages. Policy management software suites make the perfect tool to ensure the right information is found quickly so that no unwitting mistakes are made. These tools bring virtually every feature you could ask for to ensure policies are written, distributed, and understood in the most seamless manner possible. As almost all of them come with a free demo, you can try out multiple versions, and settle for the best one at no extra cost. Policies are rarely the problem; getting them to read and understood is where most companies falter. 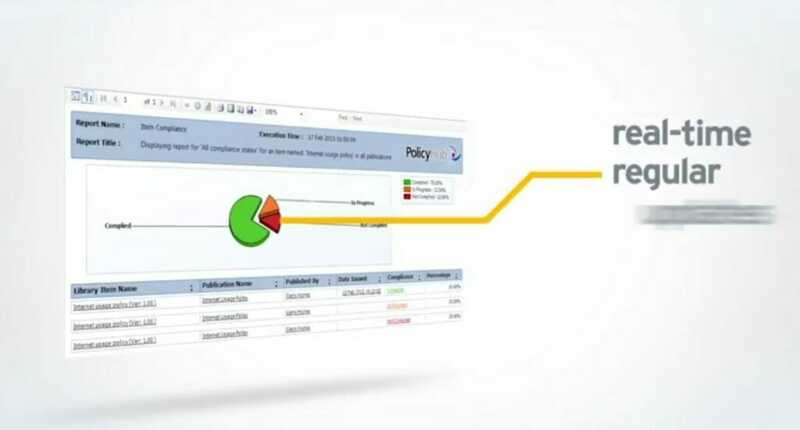 Policy management software is an ideal solution as it can automate many of the steps involved in creating, distributing, and acknowledging a policy. The Policy Cycle is a tried and tested tool to create policies. The best policies are reasonable, relevant, and realistic. When creating policies, management should consider the opinion of the employees it will govern. A policy is incomplete without well-thought-out processes and procedures to back it up. Focusing on getting people engaged with a policy is just as, if not more important than creating the policy itself. We at SweetProcess know just how complex documenting a policy can be. Download our Policy Creation Checklist for complete step-by-step instructions on how to create a foolproof policy.